StrandVision Digital Signage has extended its free digital signage weather forecast service to its electronic signage customers around the world. This complements its weather service covering the United States that has been available as a free digital signage content option to customers since the company’s founding. 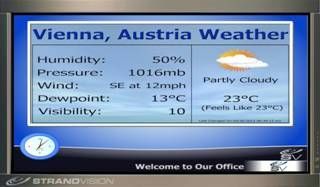 The StrandVision electronic sign network automatically formats and presents the weather information based on the geo-location of the physical screen as part of the normal electronic signage content page mix. The local weather condition and forecast information is updated hourly and automatically sent to all digital media players configured to use it. Customers with multiple licenses can present localized weather forecasts simply by activating the weather service option for their entire network or any user specified group.